All UM-Flint graduates become part of one the largest and most respected affiliations in the world: University of Michigan Alumni. More than 40,000 UM-Flint alumni are living, working, playing, and making a “Michigan Difference” in communities all over the world. Their reputation, generosity, and seemingly limitless expertise continue to open new doors and create new possibilities for UM-Flint students and fellow graduates everyday. From classroom, to internship, to dream job. Opportunities at UM-Flint help Melissa Hertlein map her way to success, and support Flint along the way. 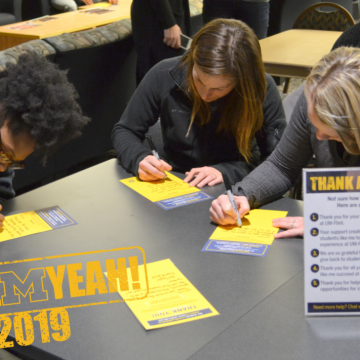 Do we appreciate our UM-Flint donors? Do we want to say thanks and make our parents proud? Hail Yeah!, we do. The entire UM-Flint campus community is invited and encouraged to attend two upcoming town halls to provide direct input to a search advisory committee about the desired qualities, experience and areas of focus for the campus’ eighth chancellor. While attending classes toward his Bachelor of Arts degree at UM-Flint, Christopher won Hopwood Awards for his essays and for the manuscript of what would eventually become his first published children’s book The Watsons Go to Birmingham—1963. It received the two highest honors for children’s literature: The Newbery Medal and the Coretta Scott King Honor. Vivian Williams credits the civic engagement projects she worked on as a communication major for introducing her to and preparing her for her current role as a troop support specialist in the Flint area. Dr. Kenneth Steibel says the research he did as an undergraduate in the UM-Flint Science Department made a difference in his career. As a student, he worked on research with faculty that he presented at the Centers for Disease Control. That experience gave him the edge as he pursued medical school and his dream of becoming a doctor. Dr. Steibel is now the Chief of Staff at Genesys Regional Medical Center, and he operates his own family practice in Fenton, Michigan. 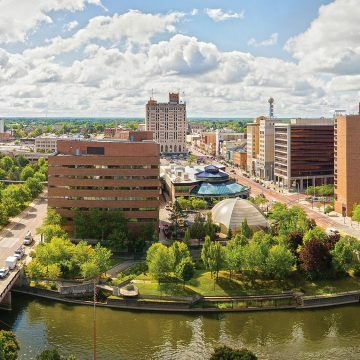 UM-Flint alumnus Ryan Londrigan is the project manager on an initiative transforming the long vacant General Motors complex along the Flint River into a community green space to be called Chevy Commons. Ernie Gilbert came to UM-Flint on a theatre scholarship, but it was his passion for cartooning and illustration that allowed his creativity and career to thrive. During his final year at UM-Flint, Ernie decided to apply for and received a scholarship to the California Institute of Arts to study animation. Today, Ernie is one of the animators of the hit Nickelodeon cartoon “The Fairly OddParents.” He received an Annie Award for animation in 2005 for his work on that show, and was award an Emmy for Outstanding Individual Achievement in Animation for the show T.U.F.F. Puppy. Erin Darke graduated with a bachelor of fine arts in theatre performance from UM-Flint in 2005. In 2015, she starred an off-Broadway play written by and starring Jesse Eisenberg, and also appeared in Love & Mercy, a movie about the Beach Boys’ Brian Wilson.